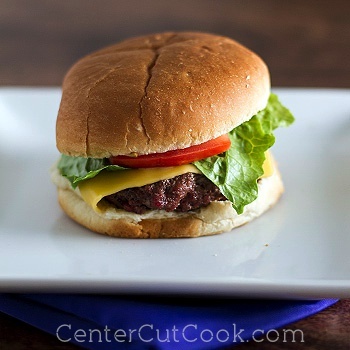 When it comes to burgers, you do NOT have to sacrifice flavor to keep things simple and easy! In every relationship, there are certain situations or circumstances that can make it or break it. In my particular marriage, for my husband, one of those things happens to be vegetarianism. Is that even a word? I’m totally kidding, but when Ryan found out I was a vegetarian when we first started dating in high school, he wasn’t going to let that fly! Ryan is your typical, American guy who loves his protein. You name it, he likes it.. beef, chicken, bacon, etc., etc., etc. And he wanted me to love all those things too. One of the first things I remember he insisted that I try was one of his Dad’s burgers cooked on the grill. He said his dad made a mean burger, and he was certain I’d like it. Funny thing, I did, and the rest is history…. It’s been a good 12 years since that period of my life when I couldn’t stand the taste and textures of meat. While I cook with meat regularly, I tend to cook with chicken the most, but every once in a while, a good burger on the grill is exactly what I’m craving! Meat: Use fresh meat and form your own patties. I tend to buy ground chuck (a good burger needs a little fat!). No short cuts buying pre-made patties from the grocery store! Seasonings: All I ever use is salt, pepper, garlic powder, and onion powder. That’s it. And sometimes it’s just salt and pepper. Grilling: Flip once. A good burger should only be flipped once! And please, by all means, don’t use the spatula to press all the juices out! Just place the burger on the grill, let it cook halfway through, flip, and let it finish cooking. Size: I typically make each burger about 3/4 of an inch thick. Remember, meat will shrink down on the grill so your burgers will look smaller after they are cooked. The next time you get a hankering for a good grilled burger, remember that you don’t need to get all fancy to have a juicy delicious burger at home! All you need is some fresh meat, a few seasonings, and badabing badaboom, you’ve got a simple, delicious grilled burger at home! I served these burgers with my favorite roasted potato salad (recipe coming tomorrow!) and fresh fruit. Serves 4. PS: Yes, these burgers were cooked on the aforementioned Big Green Egg Grill using natural lump charcoal which gives your food a flavor like none other! Toppings: cheese, tomato, lettuce, ketchup, etc. Divide one pound of meat into four. Loosely form the meat into four patties. Don’t pack them too tight, or they won’t be juicy. Season each patty with salt, pepper, garlic powder, and onion powder. Just eyeball it and gently press the seasonings into the meat. When your grill is heated, arrange the burgers on the grill. You want to cook them fast so that they don’t dry out, but not too fast or they’ll burn before they cook inside! Unfortunately, cooking times vary depending on the thickness of the patties you make, the temperature of the grill, and how you like your burger cooked. I tend to go for medium when it comes to burgers, so my cook time was about 5-6 minutes for the first side, then I flipped the burgers, and cooked them for an additional 3-4 minutes. When in doubt, use a meat thermometer! Remove the burgers from the grill, and add slices of fresh American cheese. Loosely cover the burgers with foil, and allow them to rest for about 5 minutes. During this time, the cheese will melt. While the meat is resting, lightly toast the hamburger buns on the grill.